Over this course, I have learned that being honest with yourself and your expectations of technology is essential. As an instructor, you have to set reasonable goals for yourself about how long the technology will take to learn and about planning lessons that effectively utilize that technology. As an instructor, you don’t want to throw the technology into a lesson simply for the sake of having it. It is important to ensure that the technology is used within proven teaching methods to ensure the greatest amount of benefit to the students. It’s also important to be honest with the students. I found that it is okay to admit that you are new to the technology as well, and to approach the new technology as a class community. It was helpful to have the students, who are usually a little bit more up-to-date with the “latest and greatest” teach me some of the things I did not know, or to see them work together in order to use the technology effectively. I certainly feel that using the TI-Nspire calculators, as I did in my TechQuest project, certainly helped me think about the uses of this type of technology. I was an excellent tool in the fact that it is a calculator, but it is also so much more. The handheld Nspire allowed students to explore algebraic and geometric concepts without ever having to go to a computer lab where Geometer’s Sketchpad had been installed. Additionally, the TI-Nspire has so much more than just a calculator, or just a sketchpad program; it has a full-functioning operating system that allows students to save their work, return to it later, edit it and submit it to their teachers. I can see that use to the TI-Nspire can be extremely beneficial to student learning and offers a lot of the flexibility that many teachers are looking for. Over this course, I met my own goals of learning this new technology and implementing it into my own practices. Although, I have only had a limited experience of using it, I can see many future applications and plan to continue to use it in the future. In the future, I will continue to use and integrate the TI-Nspire into my daily practices (when appropriate) and want to write a grant to get a Navigator system for the TI-Nspire so that students can wirelessly transfer files and activities within the classroom. It would alleviate the time spent on transferring files using one classroom computer and two USB cords. It would also allow students to turn in their saved work and then I, as the teacher, would be able to monitor their progress on the different applications we have done in class. (I) Using the TI-Nspire calculators to implement several activities that are relevant to the current curriculum that the students are studying. (II) Using online activities/labs that will additionally build upon their knowledge of algebraic skills. From what I have learned about doing a project like this, there are more facets that go into it than may first appear. I ran into a few “bumps” in the road when implementing this project because I did not anticipate them. The depth of knowledge I, as the teacher, would have to learn before bringing the technology to the students was certainly the first hurdle in getting this TechQuest off of the ground. I have always been a pretty quick learner of technology, but learning the TI-Nspire was a brand new and quite challenging piece of technology to try to master in just a few weeks time. I wanted to be sure that I could answer student questions about the Nspire and adequately teach the mathematical concepts at the same time, so I concentrated on first learning the technology myself, before conducting the lessons. By doing this, learning the TI-Npsire took two weeks longer (primarily due to software updates and compatibility issues and that I could only use them at work) than originally anticipated, and so I did not have to opportunity to implement as many lessons or activities as I had originally planned. Additionally, my second strategy of using online activities and labs never really got off the ground. As a stated before, finding lab time in our school is always a challenge and typically has to be booked a month or more in advance. The same was true for this project, and so by the time I had located relevant activities and had decided when they would have appropriately fit into the curriculum, I could not get the computer lab for those days. I did however, use the computer and projector in my classroom to ensure that students had exposure to these web-based activities and I also gave them the links to try on their own, but the effect was not as impactful as I had originally hoped. If I were to do something similar to this again, I know that I should plan on my own research and training to take longer than I anticipate and should, perhaps, allow myself extra time in the planning stages. Although the students did not have as much exposure or time with the TI-Nspires, or the web-based technologies, I felt that their reactions, especially to the TI-Nspire, were extremely positive. The students immediately embraced them and were incredibly receptive to trying something new in the classroom. We did complete two activities, the first one that was teacher led in a whole group, and second one that was student directed in small groups, and the students had excellent, insightful questions about the story problems and the applications of their algebra skills to help them solve these activities. Overall, I felt that my experience with this TechQuest was extremely positive, and with the Pre-Test and Post-Test data that I collected and will be analyzing next week, I certainly hope my premonitions about the positive affect of these technologies on students understanding is supported. In the future, I will be continuing to utilize the TI-Nspire technologies that are available to me and bring web-based activities into the classroom. Listen to my podcast on how my project is going. 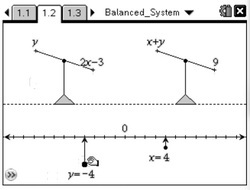 Here are some screenshots of the "Balanced Systems of Equations" activity that we attempted. 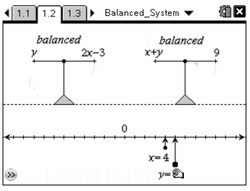 Notice in the first screenshot the x and y values do not balance the equations, and in the second one, the x and y have been moved so that they have balanced both equations. We can say that the solution for both equations y=2x-3 and x+y=9, are x=4 and y=5, or that the intersection of these two lines occurs at the point (4, 5). As I conducted my research for my TechQuest, I found that it could be put into two categories: professional research on the effects of using real-world, problem-based questions and technology integration, and technological resources that aid in the use of the technology. First, I have compiled a list of the professional research that supports the use of problem-based (or real-world) questioning and technology integration for deeper understanding of the mathematical concepts. · Effectiveness of Using Computer-Assisted Supplementary Instruction for Teaching Selected Algebra Topics at a Laboratory High School Temba C. Bassoppo-Moyo, 2010. The findings were such that computer-assisted instruction affected students’ understanding of algebra topics and improvement in attitude toward the subject. · Evaluating TI-Nspire in secondary mathematics classrooms Alison Clark-Wilson, 2008. This study indicates and many students benefited from the use of TI-Nspire calculators that promoted their confidence as well as their understanding of mathematical concepts. · Examining Students' Perceptions to Two Graphing Technologies and Their Impact on Problem Solving J. Bostic & S. Pape, 2010. This study provides preliminary evidence that TI-Nspire enhanced instruction may influence students’ use of multiple representations when solving mathematical word problems. · Faster Isn’t Smarter: Messages about Math, Teaching and Learning in the 21st Century Cathy L. Seeley, 2002. This study discusses the value of using technology tools and of students having authentic, multifaceted problems in other contexts. · Foundations for Success: The Final Report of the National Mathematics Advisory Panel U.S. Department of Education, 2008. This study summarizes research of many aspects of mathematics education including using “real-world” problems to teach mathematics and using calculators and computer-based instruction. Their findings generally support the uses of both of these things in balance with other teaching strategies. · Researching principles of lesson design to realize the pedagogical opportunities of mathematics analysis software Robyn Pierce and Kaye Stacey, 2009. This article provides insight of appropriate lesson design and integration of new technology aiming at multiple representations of algebraic functions. · A Visuo-spatial Learning Ecosystem Enhances Adaptive Expertise with Preparation for Future Learning Timothy O’Mahoney, 2008. This study used TI-Nspire handhelds with students in which they demonstrated deeper understanding of the concepts explored. I’m very interested in this research as a basis for implementation in my own classroom. Secondly, here is a list of technological resources that assist both instructors and students in the usage and implementation of the TI-Nspire calculator technology and web-based activities. · Atomic Learning TI-Nspire Provides students and teachers with tutorials and videos of how to best use the TI-Nspire calculator. · Math Nspired This website, provided by Texas Instruments to accompany the TI-Nspire calculators, will be my main source when implementing the Nspires. Educators create the lessons and activities on this site and many of their objectives reach beyond understanding mathematical skills and into application. · Supply and Demand This interactive activity has students solving systems of linear equations in which they gain a greater, cross-curricular understanding of the principles of supply and demand. · Systems of Equations: An Aid to Decision Making This interactive lab from Glencoe features use algebra functions in order to choose the best cellular phone plan for you. It used scaffolding to guide students through the algebraic steps in the decision making model. · Technology Tips: Simulation with the TI-Nspire Heidi J. Rudolph, 2009. This article provides teachers with tips on using the TI-Nspire for mathematical modeling in the classroom. What I have learned from performing this search is that problem-based questioning, or real-world questioning is widely supported by mathematics educators and researchers, however, it must be balanced with conceptual understanding as well as learning skills, facts and procedures. With these elements together, students can gain a deep, connected and comprehensive mathematical program. The professional research also indicates that the emergence of TI-Nspire calculators and their use in the classroom offered students the means of obtaining a deeper understanding of the concepts explored. Using the TI-Nspire handhelds will also boost confidence in mathematics and students are more willing to take risks and questions their mathematics when it is not in black and white on a piece of paper. The technology allows the students to be mobile with their math and reach them on their own level as a part of the Internet Generation that has grown up with technology. Through doing this search, I have once again had to hone my skills of doing academic research that I utilized so frequently in undergrad. It was important for me to look at several research-based studies that used similar technology and strategies that I am interested in implementing. After reading the Valenza article, I began my search like many of my students; I began with google.com. However my searching turned up few results in the beginning and I found myself look through page after page of unusable websites. Next, I tried Google Scholar for the first time and found more results that applied to my research but again many that did not. It was once I began my search on the Michigan eLibrary that I found the most of the resources that I have listed above. The flexibility that MeL offers was wonderful and the access to the full-text of books and articles was a great advantage over limited readings and previews using other search engines. Lastly, as a student of Michigan State University, I used the resources of the University Library to round out my search. Most of my professional sources would not have even begun to surface with a Google or other common search engine; I have found that for truly academic research, an academic search has yielded the best results. In the past I have relied on these types of searches to assist me in academic research and I think that in the future, I will do the same. Sometimes, Google isn’t everything. Educational Need: My Algebra students have difficulty with mathematics reasoning. When learning an algebra skill, students can solve problems in basic form and follow the structure of an example on daily assignments, but they struggle with application of those mathematical operations outside of isolation. Specifically, students have difficulty applying mathematical skills to word problems, real-world situations, or struggle with multi-step applications of the skills. Rationale: Mathematics is the oldest and most universal part of our culture that we share with all the world. It has its roots in the most ancient of times and the most distant of lands and has been used to solve the problems of civilization for centuries. Many high school students in my math classes asked the long-standing question, “When will I ever use this?” But the truth is we use math everyday. Students use math to solve the most simple or most complex of problems that they can encounter in their school or professional careers. But simply having the ability to “do” math does not help the students calculate how many yards of mulch to order, or calculate how to plan for retirement. It is mathematical reasoning that allows students to take the concepts and skills of “doing” math and apply them into their lives everyday. Although it seems so obvious to math elites, math learners struggle with the application of mathematical skills outside of the “plug-and-chug” homework assignments, I’ve even found that some students can do the problem and then not be able to explain what it is they actually did or why. Through this, I hope to find a solution that will help students not only strengthen their skills, but be able to apply those skills to word problems, real-world situations, or multi-step applications of the skills they already know. By improving math reasoning, it will improve student comprehension and confidence in the their mathematical abilities, but also provide students with the foundation for continued problem-solving beyond school and into their futures. Addressing the Need with Technology: I plan to use several technology interventions with my Algebra Support class to strengthen their understanding of mathematical reasoning problems. I.) Our school has several new sets of TI-Nspire calculators and I will implement several activities that are relevant to the current curriculum that the students are studying utilizing the TI-Nspire calculators. The activities will have in-depth questioning and problem-solving issues in which the students will have to take their knowledge of algebraic skills and apply them to deepen the meaning and understanding of the concept. II.) Secondly, I will have the students use online activities/labs that will additionally build upon their knowledge of algebraic skills in order to gain a greater depth of understanding of real-world application of these skills. www.mathnspired.com This website, provided by Texas Instruments to accompany the TI-Nspire calculators, will be my main source when implementing the Nspires. The lessons and activities on this site are created by educators and many of their objectives reach beyond understanding mathematical skills and into application. University of Washington Study conducted by Timothy O’Mahoney This study used TI-Nspire handhelds with students in which they demonstrated deeper understanding of the concepts explored. I’m very interested in this research as a basis for implementation in my own classroom. http://www.thinkfinity.org/ This website has been the beginning of my search for web-based tools and activities that utilize the content standards and concepts that my students are learning about. Implementation Plan: During this course, I plan on introducing the students to the TI-Nspired calculators and conducting at least two lessons with them. There may be the need for a day on a “get-to-know-the-calculator” activity since the TI-Nspires are unlike any of the other calculators that the students have used before. I also plan on utilizing our school computer labs for the web-based activities that the students will be doing. I am hoping to get at least two days in the lab, however, this will take some advanced planning since computer labs times are difficult to schedule unless they are planned well in advance. Once I have completed this project, I am hoping to incorporate these technologies more often in my classes and hopefully use the data I’ve collected from these to present a proposal to our school administration in support of purchasing more sets of TI-Nspires in the future. The Teacher: As the teacher, I will need to learn how to use the TI-Nspire calculators and how to load programs onto the calculators that the students will be using in class. I will also need to ensure that the questions that accompany both the calculator and web-based activities are relevant and achieve a deeper understanding of algebraic concepts. The Learner: The learners will have to be able to follow direction and become acquainted with the new TI-Nspired technology as well as the web-based activities. They will need to monitored for appropriate use of this technology. The Subject Matter: The subject matter, Algebra I, will be broken down into manageable concepts and skills and will be organized in a way in which concepts and skills are intertwined into word problems, real-world situations, or multi-step applications. The Context: There will be instruction on appropriate usage of the TI-Nspire calculators in the classroom. Additionally, the computer lab will need to be checked to ensure that the web-based activities are not blocked by our school’s firewall. Students will need to be reminded of their technology usage contract that they signed and the consequences for inappropriate use in hopes to minimize misuse. Compelling problem of practice: My Algebra students have difficulty with mathematics reasoning. When learning an algebra skill, students can solve problems in basic form and follow the structure of an example on daily assignments, but they struggle with application of those mathematical operations outside of isolation. Specifically, students have difficulty applying mathematical skills to word problems, real-world situations, or struggle with multi-step applications of the skills. Rationale: Mathematics is the oldest and most universal part of our culture which we share with all the world. It has its roots in the most ancient of times and the most distant of lands and has been used to solve the problems of civilization for centuries. Many high school students in my math classes asked the long-standing question, “When will I ever use this?” But the truth is we use math everyday. Students use math to solve the most-simple or most-complex of problems that they can encounter in their school or professional careers. But simply having the ability to “do” math does not help the students calculate how many yards of mulch to order, or calculate how to plan for retirement. It is mathematical reasoning that allows students to take the concepts and skills of “doing” math and apply them into their lives everyday. Although it seems so obvious to math elites, math learners struggle with the application of mathematical skills outside of the “plug-and-chug” homework assignments, I’ve even found that some students can do the problem and then not be able to explain what it is they actually did or why. Through this techquest, I hope to find a solution that will help students not only strengthen their skills, but be able to apply those skills to word problems, real-world situations, or multi-step applications of the skills they already know. By improving math reasoning, it will improve student comprehension and confidence in the their mathematical abilities, but also provide students with the foundation for continued problem-solving beyond school and into their futures. The constructivist (or project-based) approach to teaching has been a reoccurring theme that has dominated many of the teaching strategies that we have learned about. What I like about constructivism is how it identifies learning as an active process that creates different roles for student and teacher. Using this strategy encourages students to discover, research, and learn with a teacher as a facilitator and supporter of that learning. I think that one medium in particular lends itself to constructivism: the Internet. There are many web-based tools, programs, and websites that can be used to support a constructivist approach to teaching and learning. WebQuests, blogs and wikis can all serve different purposes within the context of the classroom. As I learned about and explored these tools, I felt that hearing about them was one thing, but to use them was another. I don’t feel that I would have gained the strong appreciation for these web-based technologies without using them in my own learning in this course. The strongest reason I can say this it that I’ve heard about all of these technologies before. But by only hearing about them, without using them, I was able to easily brush them aside and continue on with what I had previously been doing. By actually experiencing my own learning through the use of these tools, a truly constructivist approach on my instructor’s part, I was able to better understand and know the capacities of using these tools for myself and quite possibly, for my students in the future. In this course, I have met my own goals, and become more versed in the many Web 2.0 tools that I can use to enhance my teaching and engage my students. I have learned not only how to use these tools, but how to make them meaningful for my students. I have learned that integrating technology is not something that happens on its own; a teacher must first experience this technology himself or herself, and then can build that technology and its ideas into a curriculum. I have learned that technology is not a teacher on its own, but a tool for teachers to use with their students. I have learned too many things to write on this blog. But what I do know, as I look to the future, is that I will not stop learning about new technologies. I will not stop trying new things in the classroom in an effort to better reach my students. I will not be so set in my ways that I will close off any new ideas that may help me teach more effectively. I will not live in the “They didn’t do it that way when I was in school” or the “That’s not the way we’ve always done it” mentality because the students are living in a different age, and its time that out methods and tools came into the 21st century too. This is the 21st century and I hope to be a 21st century teacher. After viewing the Michigan Merit Curriculum Online Experience Guideline Companion Document, I find hard to believe that I had not known about it before now. I was aware of the State of Michigan’s Online Experience Requirement for students in grades 6-12; however, this document is a wonderful resource and addition to my ‘bag of tricks’. Within this document, I have learned about so many resources that I might use in my history and algebra classrooms this fall. And with the school year fast approaching, I am thinking more and more about the applications of these technologies. Two of the technologies I am currently planning on implementing this year are WebQuests and blogs. In particular, I feel very strongly about my students having meaningful writing experiences, and therefore I am looking at using blogs to help my students write and think authentically about algebra. I know many of you will think, or say, “There’s no writing in math class,” but I beg to differ. The students write math problems all the time, but why not use a blog to discuss what methods we use to solve these problems, or real-life applications of the math we are learning, or even a personal reflection about learning math. I feel that there is great potential using blogs in my math classes and I’m excited to see the results. On the topic of WebQuests, I have previously had many activities in my history classes that have reflected the some of the key ideas of a WebQuest, but I appreciate the flexibility of these online resources in being able to adapt to different curriculum and classes. I have created one web quest in my CEP 811 class, but am eager to explore other quests that have been created. Some of the resources I feel that I would have amore difficult time integrating would be test preparation tools and career planning tools. As I teach primarily ninth grade, many of the test preparation tools come into play in grade ten and eleven as students prepare for the ACT/SAT. Although career-planning tools are important, these tools are primarily used with our counseling office to assist students in planning for courses and post-high school education and training. Since our counselors do such a wonderful job in using these tools effectively with students, I feel that my own attempts at using them would fall short and not benefit my students. All in all, this companion document has many benefits and resources, no matter what arena of education you work. Today, I took a serious look at Google Presenter as an educational tool. I had seen it before and have even dabbled in Google Docs, but had not used Presenter or even played around with it to see what its capabilities were. One of the things I immediately noticed is how Presenter functions very much like Microsoft’s PowerPoint. So much so, that it did not take very long at all to become acquainted with the program. As a teacher, I could see great possibilities for me to use this to upload and post notes to a shared folder, that way my students could access my presentations. I also thought of the great potential for Google Presenter to be used when my students are making collaborative presentations, especially for a project I’ve done in the past involving the 1920s. For history especially, I can see it being used to share information with my classes, or to even to make flash cards as study guides. There is great potential in being able to use, share and collaborate with a program like this online. I am hesitant however, since I know that my school has a pretty hefty firewall and usually sites like this are blocked on school computers, which can be frustrating for both my students and me. I also noticed that Presenter does not have many advanced features, such as slide transitions, animations, or addition of sounds, and had very few themes available to change the look of your presentations. All in all, I think that the online accessibility of using Presenter has great potential, but I can perceive a couple of roadblocks with implementation…. especially with ensuring student security online. Blogging has become a form of self-expression, self-reflection, story-telling and interest sharing. But blogs in the classroom? At first I didn’t see it, even after hearing about it for years, I still didn’t get it. But then, the lightblub went on. Ding! I’ve got it. Classroom blogs can do/be so much more than another way to give students homework. A blog can be a way to build a cooperative learning environment where students read, write, challenge, debate and build shared knowledge. Students can practice, review and apply this knowledge and together, can gain a greater understanding of their own learning and the content. Simply by participating in a blog, students are practicing their skills and concepts they’ve learned. From debate the end of WWII to discussing the best method for factoring, students can further their learning and create that cooperative learning that so many teachers desire. Of course, blogging has it negatives too, especially with math, cannot summarize and provide notes for students, it cannot provide curricular alignment, and blogging cannot always provide assessment to students, although blogs can be a tool with long-reaching possibilities, it cannot always do or replace something that is done by a teacher or in the classroom. I can certainly see the use of blogs in my classroom, especially to generate discussion on current events that relate to our study of history or to continue discussions that began in the classroom, to the web. I think that blogging, even more specifically, can be integrated into the normal rigors of homework/practice to provide my students with a more cooperative assignment that generates deeper understanding. Hmmmm… we’ll have to wait and see, but I hope so.